I met Will at East Carolina University during our sophomore year. We were introduced by mutual friends and his sisters were also in my sorority. We both wanted a venue that incorporated the water and our love for the coast. Will is from Wilmington and my family has had a home on Wrightsville my whole life. So having our wedding on the sound was perfect for us! How did you decide on your bridesmaids dresses? 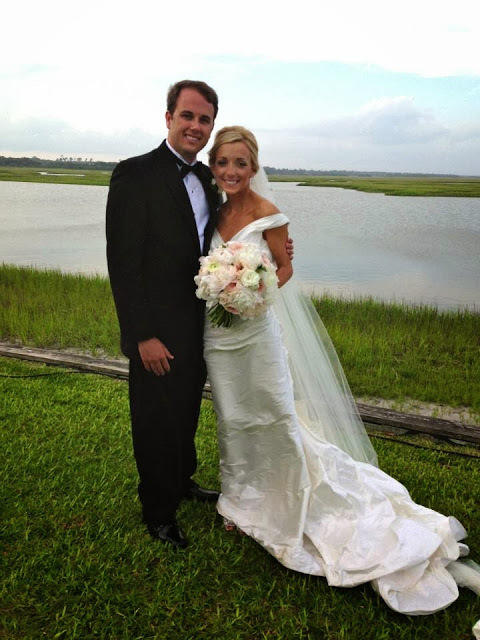 I was first drawn to the Amsale dresses (from Bella Bridesmaid Raleigh) because of the color and the style of the gowns. Once I tried it on, I knew it would be perfect for my girls. The one shoulder chiffon gown was flattering on all the girls and the fabric was great for a summer wedding. My wedding was black tie optional and I felt the dress fit the attire of the wedding, but still allowed them to be comfortable. My gown was an off the shoulder Romona Keveza gown. The gown had a structured bodice and a small train. I loved my dress because it was classic, but still had a flare to it! I loved getting ready with my bridesmaids and my family. We all got our hair and makeup done together. The whole day was wonderful just having all the people you love in your life all together is so special. Style Me Pretty and Pinterest were great sources of inspiration for me during the planning process. I wanted the wedding to reflect our personalities. The ceremony took place outside under a tent on the sound at Figure Eight Island, NC. Will and I both love the water and thought it would only be appropriate for us to get married outside on the sound. Religion is very important in our lives and we wanted to make the ceremony feel spiritual since we were getting married outside. We had a wooden cross made to stand at the end of the isle for the ceremony. This was a meaningful way for us to incorporate our spirituality. As for the reception, I wanted it to feel very romantic and elegant. We had a combination of white flowers with gold accents and lots of candles surrounding each center piece on the tables. We left on a boat from the reception and it was so special to look back at everyone we love on the dock all lit up. I would say to enjoy every moment of your engagement period and wedding day. It goes by so fast and its such a a special time in your life. Do not fret on your wedding day because its not worth it! Just remember what is most important and enjoy the whole experience!